Why do most pianos lose it? The golden balance is somewhat fragile, and will only appear if all the systems in a piano are functioning optimally. Climate swings: our New England climate is very hard on pianos, particularly soundboards, and it tends to accelerate their aging. So how do you achieve the golden balance? By making sure all the piano’s systems — action, hammers, soundboard and belly — are functioning optimally. I can help you achieve the golden balance. My job is to create beautiful piano sound. 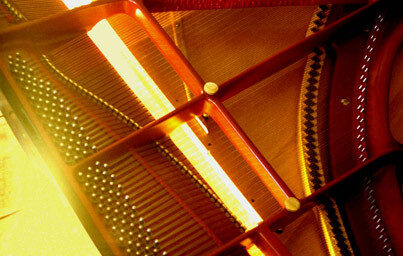 By accurately diagnosing weak links in your piano’s systems I can efficiently target and correct problem areas that are keeping the golden balance from appearing.